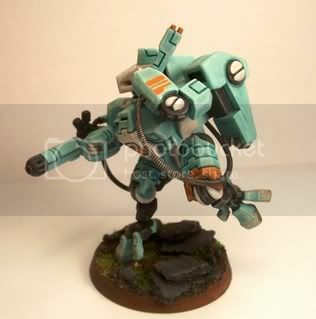 Here are a couple of my XV8-2&#39;s...hope you guys like them. C&C appreciated. Nice stuff! Don&#39;t drop them on the floor! They look better than the last ones, which look great, please don&#39;t start repainting again. I can&#39;t wait to see the whole army done. 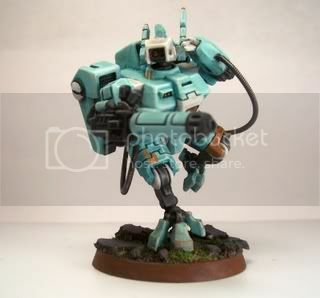 Awesome poses and awesome painting as well! I love the wires from the backpack to the arms. I forgot to ask, Did you use magnets for the weapons again? Nice. Very smooth colour. 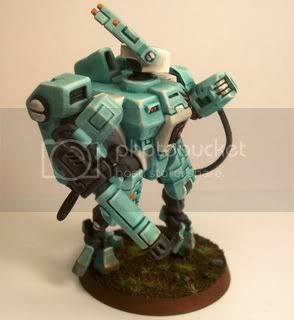 BTW I would have thought the TAU would have something to prevent birds flying into them(battle damaged one). 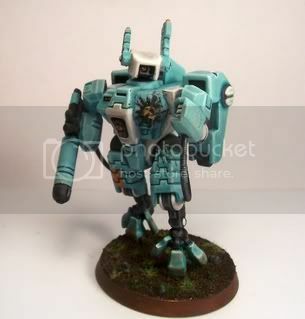 I now have an image of some Tau piloting a damaged battlesuit. A bird flies in, "What the ****?" The suit starts flyign in circles through the air. The Tau pilto falls out ripped apart. The battlesuit is covered in twigs and branches. A cat sneaks up lookign for birds to eat. The suit blasts the cat with aburst cannon.